For those which are ready to be bought, I'll add them to my "ready" watchlist and enter orders for them in my broker's system the next morning. For others, which still need some time to form a setup I like, I'll add them to another watchlist. 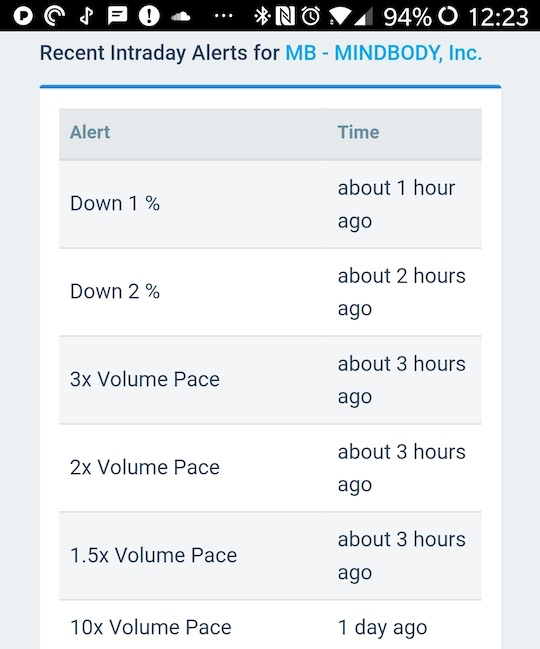 So these intraday alerts don't help me with those 80% of trades / orders which I have set in my broker's sytem at already determined price levels. But it's those stocks sitting on the other watchlists that the intraday alerts are helping me with. Most of the time I won't look at the stocks in those watchlists while the market is open. I look at them in the evening to see if they made any fresh setups during the day. Oftentimes I'll see that one of them pulled back to some obvious entry point during the day and I'll think "if only I'd seen that when it was at that price..."
I could add all those stocks to my trading system (I do add some of them) and watch them in real time but that becomes overwhelming. Also my broker's system doesn't have some of the alerts I've added, like alerting me to a 50-day moving average break or touch. If I entered them into my broker's system I'd also then have to go manually set a bunch of alerts. So I've got my SwingTradeBot intraday alerts page to the left and my trading system to the right. Every 15 minutes or so I'd just check the charts of the stocks which triggered alerts. 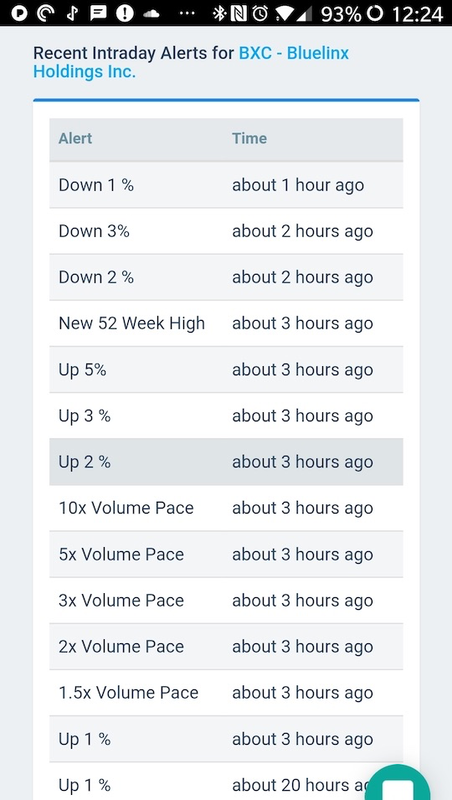 Here are two trades I got into today thanks to these alerts. Update: I'm no longer periodically refresheing the web page, the intraday alerts are now being pushed to the SwingTradeBot mobile app. So I just wait for a notification to pop up on my phone and then I check the alerts. 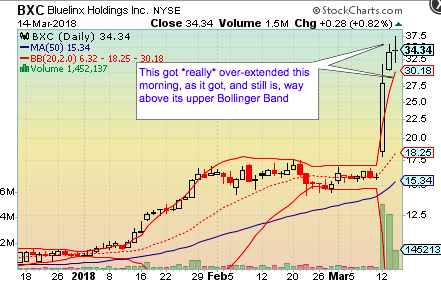 Those volume alerts plus the down 2% alert made me take a look at MB. What I saw was that it was in the midst of a pullback right to the breakout point. I could see that it was trying to bounce off of yesterday's gap and I decided it was a good risk/reward ratio to jump in at that level. 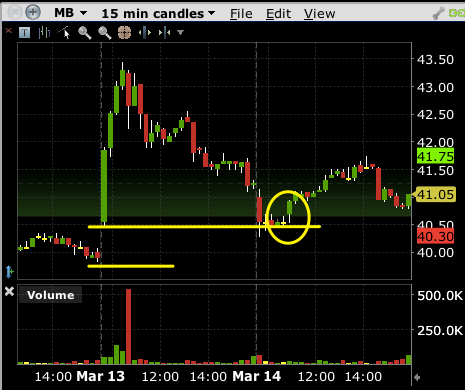 I placed a stop loss order where the lower yellow line is as protection in case the gap couldn't hold. That's an example of an intraday move I probably wouldn't have seen given the way I tracked stocks before starting to use these new intraday alerts. 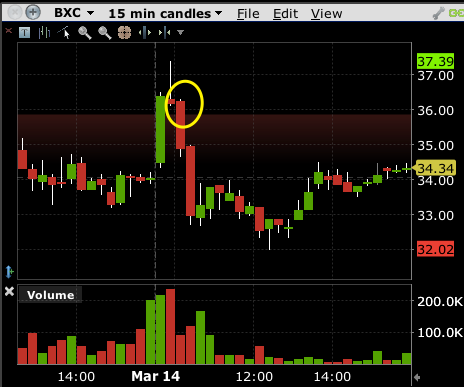 That second candle of the day (15 minute candlesticks) gave a nice bearish shooting star to trade off of. 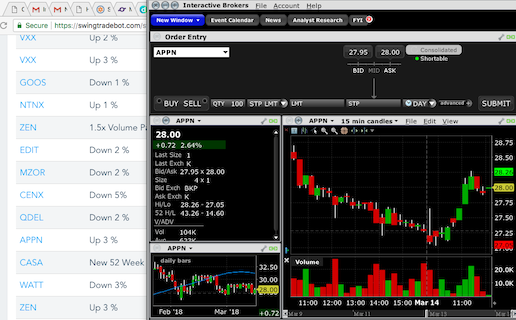 I shorted it just under 36 with a stop at the high of the day. Again, this is something that I probably wouldn't have noticed if not for the alerts. I was content to wait for this to consolidate or pull back to give me a long entry in the coming days or weeks but that short opportunity was too good to pass up. I considered covering when it popped back above 33 but I'm going to try to hold for 30. Note that with neither of these trades did I need to have a real-time alert. In fact, I think it was better for me to see these in a little bit of a delayed fashion. I may have tried to short BXC while it was making that first candle of the day had I seen it in real time. I think these alerts are a nice extension to the reason I built SwingTradeBot in the first place. I want it to watch a lot of *my* stocks for me and let me know when they do something interesting. So far I'm very happy with them.